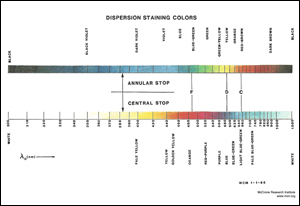 The McCrone Dispersion Staining Color Chart provides the colors observed with dispersion staining and either type of stop: annular stop or central stop. The colors shown are a continuous series throughout the entire range of the matching wavelength (Î”0). This is the basis of a method of determining Î”0 by comparing the colors produced when either the annular or central stop is used.